Costa Rica weather overall is quite mild. The country is unique for having over a dozen micro-climates, all of which feature different characteristics. Vistors might say that weather in Costa Rica is absolutely unpredictable, but that is not really true. The weather is tropical all year long because of its proximity to the equator. The degree of humidity or dryness varies depending on what part of the country you’re in. Weather can change from province to province (and sometimes from neighborhood to neighborhood! ), however it rarely becomes too extreme or unmanageable. A light sweater and a raincoat will keep you safe during the winter, while shorts and a water bottle will get you through the summer. Know where you’re headed? Our guide to Regions of Costa Rica can help you decide what to pack. If you’re using a travel agency to book your vacation, make sure to ask about the differences between high and green season. 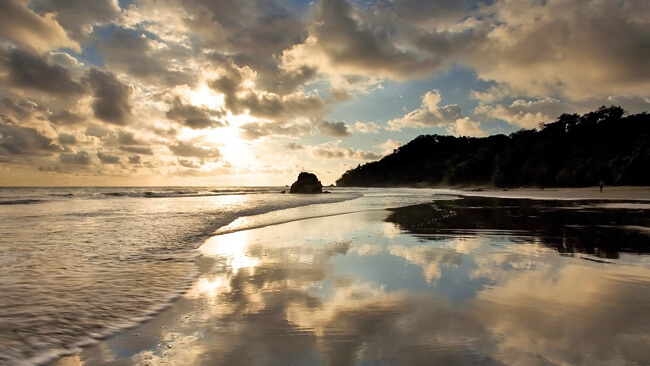 You will discover that the best time to visit Costa Rica is merely in the eye of the beholder. Overall, Costa Rica is blessed with year-round warmth, so it really depends on what you’re looking for to determine when is best to come. Your Costa Rican Vacations Travel Consultant can help you with this! Unlike other countries with four established seasons, the climate in Costa Rica can easily be divided into two seasons: rainy and dry. Or, summer and winter. High and low. You get the idea. Generally, summer is from December to late April and the rainy season is from May to November. The Caribbean coast is the big exception, where the seasons are flipped and the driest months are mid-May through mid-November. Confused? Read on. The dry season, which runs from late November until late April, is also known as the high season or summer. During these months, the weather in many parts of the country is very warm getting little to no rain, and with temperatures ranging from the mid 80’s to the high 90’s depending on which part of Costa Rica you are in. However, in some provinces, seasonally cool winds offer some respite from the heat, particularly in January and February. Temperatures tend to reach their highest in March and April at the peak of the dry season. Because the summer season occurs during the cold winters of the Northern Hemisphere, Costa Rican summers attract thousands of tourists annually who flock to the beaches of the Pacific and Caribbean coasts. While the rainy season attracts fewer tourists, it’s unarguably the time of year when Costa Rica is at its most beautiful. May to November is affectionately called “The Green Season” by tourism experts and is the time of year when all vegetation starts to grow again and the country blooms into life and becomes incredibly lush. Although temperatures rarely drop below the mid-60s (around 18 degrees Celsius), the overall climate is much wetter, and thunderstorms, heavy rains, and tropical depressions are far from unusual, especially in the afternoon. It can be quite a spectacle! During June and July, Costa Rica often experiences short dry spells—called the “little summer”, but in September and October, the amount of rain can make getting around some parts of the country highly problematic, as landslides and other natural obstacles become more common. While rain might put some people off, most of the time a good rain jacket, closed shoes and an adventurous spirit will be more than enough to enjoy the weather and the rich wildlife you can observe during this time of year. The climate of Costa Rica is almost as diverse as the landscape of this stunning country. Despite being less than 1,000 miles from the equator, Costa Rica has a range of different climatic conditions, some of which are affected by the delicate ecosystems that can be found across the country. Although it’s true that many parts of Costa Rica are hot and sunny, don’t make the mistake of assuming this will be the case wherever (and whenever) you visit, as the weather can vary quite widely from one region to the next. Although Costa Rica’s seasons are reasonably well defined, the diversity of the country’s landscape means that some provinces experience significantly different weather than others. Guanacaste, Costa Rica’s northwesternmost province, is the driest part of the country. Temperatures here rarely fall below 85 degrees Fahrenheit (around 29 degrees Celsius), and the region receives much less rainfall than other areas. During the dry season, it is not uncommon for Guanacaste to go several weeks without any rainfall at all, and even during the green season, precipitation is often limited to the occasional scattered afternoon shower. On the other hand, some provinces receive more than their share of rainfall. Limon, Costa Rica’s easternmost province bordered by the Caribbean Sea, is much wetter. Typically, Limon’s climate is the opposite of other Costa Rican provinces. As such, the dry season runs from May to November, and the green season lasts from November through April. At the peak of the dry season, the climate in Limon can be very humid and muggy, and during the green season, rainfall can be heavy. Even during the dry season, Limon tends to get more rain than other regions. Depending on where you plan to visit, you could experience one or more of Costa Rica’s microclimates – highly concentrated areas where rainfall, temperature, and other conditions vary depending on factors such as the terrain and elevation. One of the country’s most famous microclimates and a consistent draw for eco-tourists is the rainforest. As the name suggests, these dense jungles receive a lot of rainfall, which is what helps so many different types of exotic plants and flowers thrive in these environments. This, in turn, can make conditions in the rainforest very humid. However, this can also depend on which rainforest you’re visiting. To read more about the rainforest go to the Rainforest Weather section. Cloud forests, on the other hand, differ from rainforests in several ways. The elevation is the most important distinguishing factor between the two, as cloud forests are much higher than rainforests. It is the increased elevation of cloud forests that contributes to the mist and fog these beautiful forests are known for. In addition, cloud forests often feature dramatic shifts in altitude and topography – the difference between the tallest points and the shallowest valleys. This variety in topography results in heightened accumulation of atmospheric moisture and rainwater. To read more about the cloud forest go to the Cloud Forest Weather section. Of course, mountainous areas have their own microclimates. Reaching elevations of up to 11,000 feet in some areas, mountains, and the surrounding countryside are often significantly cooler than areas closer to sea level. This is particularly true of mountains like Cerro Chirripo, the tallest point in Costa Rica. Even during the high season, temperatures at this mountain can plunge to between 45 and 55 degrees Fahrenheit (7-12 degrees Celsius). Not everywhere in Costa Rica is hot and sunny year-round! Much of Costa Rica is covered in dry forest. As the name suggests, these areas receive little rainfall, even during the green season, and are typically found in southern Guanacaste and parts of the Nicoya Peninsula. Despite the relative lack of precipitation, many hardy plants, flowers and trees thrive in these environments. Costa Rica is famous for its dense rainforests. These magnificent jungles cover much of the country and are home to an amazing array of exotic plant and animal life. As the name implies, these forests can get a little damp, but you might be surprised by how much the weather and climate of Costa Rica’s rainforests can vary. Many different parts of Costa Rica have rainforests, but the climates of each forest can vary depending on where it is located. For example, the central Pacific region that encompasses Manuel Antonio, Jaco and Puntarenas is known for its high temperatures and humidity, however under the canopy of the rainforests in these areas temperatures are often much cooler than those found in the Northern Pacific Coast. The reason for these differences is largely due to variations in elevation, as higher altitudes in the mountains of the central Pacific are often accompanied by lower temperatures. In addition, the central Pacific region is where the true rainforests really start; the forest of the North are typically classified as tropical dry forests. Rainforests differ from cloud forests by elevation, as cloud forests are found in cooler-climate of the central mountain region, above 4500 ft (1500 m). Some of Costa Rica’s rainforests can receive between 80 and 260 inches of rain every year, and while temperatures can exceed 100 degrees Fahrenheit (37 degrees Celsius) in the daytime during the height of the dry season, the mercury can fall to the low 60s (around 15 degrees Celsius) at night. Although Costa Rica enjoys a temperate climate year-round, the timing of your visit will have a significant impact on the weather you’re likely to experience in the country’s rainforests. For most parts of the country, the dry season runs between December and April. While Costa Rica has a clearly defined rainy (or green) season, that doesn’t mean you won’t see some heavy rainfall during the dry season. Costa Rica’s Caribbean coast often experiences strong storms that form over the Atlantic Ocean year-round, resulting in heavy rainfall. This, of course, provides the lush vegetation of the rainforest on the eastern slopes of the Central Mountain range, but it also means you should be prepared for a wide range of climate conditions in this area. If you plan to visit Costa Rica’s rainforests during the dry season, wear comfortable, loose-fitting clothing, preferably made from a lightweight material such as linen. Temperatures can soar in the dry season, making the rainforests very hot and humid, so plan to dress accordingly. Conversely, if you’re coming to Costa Rica during the rainy season, bring a light, waterproof jacket and long pants, not so much for the temperatures as they stay the same as in the dry season. However, early afternoon showers are very common and although they don’t last for long, rain could come as a surprise out of the blue skies. Regardless of when you choose to spend time in Costa Rica’s stunning rainforests, there are a few things you’ll want to bring with you to ensure you have an unforgettable trip. The first is insect repellent. Costa Rica is home to an incredible variety of bugs, including some bothersome pests like mosquitoes. Applying a moisture-resistant insect repellent before venturing into the heart of the Costa Rican rainforest is a great way to ensure that the bugs leave you alone. Another essential when spending time in the rainforest is water. Costa Rica’s national parks and wildlife reserves are among the most beautiful places on Earth, but many of them are highly isolated, and the nearest services may be many miles away. Bring bottled water, particularly if you plan on engaging in potentially strenuous physical activities like hiking—the last thing you want is to end up dehydrated! Although rainforests and cloud forests share many characteristics, the weather is not among them. Costa Rica has some of the most beautiful cloud forests in the world, so be sure you know what to expect from these magnificent forests’ weather before you venture into your Costa Rican adventure. The primary difference between rainforests and cloud forests is their elevation. Rainforests are typically located at elevations much closer to sea level than cloud forests, which is why they can get so hot, particularly during the dry season. Cloud forests, on the other hand, are found at higher elevations, which makes them noticeably cooler than rainforests. Although the height of trees commonly found in cloud forests may not seem important to these forests’ climate, it’s actually a major contributing factor in what keeps cloud forests so cool. As cloud forests are sometimes adjacent to large mountains, trees do not grow as tall as they do in many rainforests. The result is that the canopy of the trees effectively traps moisture from rainfall carried by the wind. This, in turn, creates the dense patches of fog for which these forests are named. In addition, the milder temperatures of cloud forests substantially slow the evaporation process, which is why these magnificent forests are often permanently shrouded in thick blankets of fog. Another unique point about cloud forests is that of their topography or the change in elevation within a small area. Some of Costa Rica’s cloud forests, such as the one in Monteverde area, vary widely in their topography, featuring high ridges and deep canyons. This creates unique microclimates that can trap rainwater, creating cooler spots where the fog can be particularly dense. Of course, the difference in topography also makes cloud forests an excellent destination for avid hikers! If you plan to spend time in one of Costa Rica’s cloud forests, you should pack accordingly to get the most out of your trip. Firstly, it’s important to remember that, due to their elevation and heightened levels of atmospheric moisture, cloud forests are often quite cool, even during the dry season. For example, Monteverde Cloud Forest is situated more than 4,600 feet (1,400 meters) above sea level. Even at the height of the dry season, temperatures can be crisp. Bring a waterproof jacket with you as well as suitable footwear, especially if you intend to hike the trails found within Costa Rica’s cloud forests—the moisture in the air can result in deceptively treacherous conditions. While the cooler conditions are generally more pleasant to hike in, it can also get warm. Whether you’re taking a brief tour of these forests or going on an all-day hike, be sure to dress in layers and bring plenty of water with you. If you don’t have much experience in wilderness hiking, it may be worthwhile hiring a tour guide when venturing into the depths of Costa Rica’s cloud forests. The dense mist can obscure visibility substantially, especially during the rainy season, and this makes it much easier to get lost amid the overgrowth. To get the most out of your vacation and experience everything these amazing forests have to offer, consider hiring a guide who knows the park. Costa Rica has great things to offer all year long and choosing the “best” time to come is entirely subjective depending on what you’re looking for. Many say the best months of the year to travel are May/June, July or November. May/June and November represent the “cusp” of the seasons—the change from dry to rain in May and vice versa in November. This means that you can expect very little rain, perhaps an hour or so in the late afternoon but rarely more than that. The countryside is lush and green, marking a difference from the browns of the dry season. During these months, you still get the low season rates and amazing deals, plus the good weather. On top of that, every July there is a two/three-week long phenomenon called the ‘Little Summer of San Juan’. Basically, it is a two/three-week dry spell during the middle of the green season. The green (rainy) season starts around mid-May, but it gets a much undeserved bad reputation. A typical day in the green season starts off hot and sunny and then, if it does rain, it will cloud up at 2-3 PM and rain for a couple hours until it clears up again at 5-6 PM. This is the rule of thumb—there are days when it might rain more, but there are also days when it won’t rain at all, especially in July. The only months where it may rain all days are September and October and even these months will see sunny days. This time of year temperatures rarely drop too harshly, but the rainy afternoons can be an acquired taste, especially for those who expect Costa Rica to be the land of eternal summer. The rainy season has many wondrous elements, though, particularly because the entire country seems to become greener. Trees and flowers are in bloom, and what at some point might’ve been an arid countryside, is turned into paradisiacal scenery. Green season is ideal for nature lovers who will undoubtedly be thrilled by the variety of animal and plant species they will see here, especially for whale watching and turtle nesting tours, as this is the prime season when these animals migrate to Costa Rica. Prices tend to drop too, making the green season perfect for travelers with tighter budgets. The dry season—aka summer aka high season—running from mid-December through the end of April, is best for your sun worshiper, although not quite as good for wildlife spotting. During this time of the year temperatures rise all over the country. Because of its proximity to the equatorial line, seasons are “inverted” in Costa Rica and while other countries celebrate snowy Christmases, the weather in places like Guanacaste is pleasantly warm, giving you opportunity to unwrap those Christmas presents on the tropical beach. High season is perfect for Americans and Europeans who are looking to escape the harsh winters of the Northern hemisphere. High season offers endless options for travelers who mostly visit the beaches of the Pacific and go on adventure tours in the Arenal area. For obvious reasons, hotels, airfares etc. tend to be more expensive during the high season. Most local schools and universities are on vacation, too, which means the beaches and other tourist destinations might be more crowded.